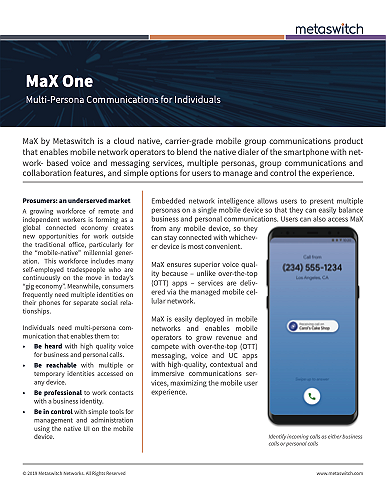 MaX by Metaswitch is a cloud native, carrier-grade mobile group communications product that enables mobile network operators to blend the native dialer of the smartphone with network-based voice and messaging services, multiple personas, group communications and collaboration features, and simple options for users to manage and control the experience. Embedded network intelligence allows users to present multiple personas on a single mobile device so that they can easily balance business and personal communications. Users can also access MaX from any mobile device, so they can stay connected with whichever device is most convenient.